How to Upgrade Gateway Laptop Hard Drive without Losing Data? Have you ever tried to upgrade your Gateway hard drive? This article will help you finish the task of Gateway laptop hard drive upgrade without losing any data. Why you want to upgrade Gateway laptop hard drive? Gateway laptop is very poplar among computer users. People use it to study, work, play, etc. While using Gateway laptop, you may store a lot of data on the Gateway laptop hard drive. However, with the growing number of your data, you will find that the Gateway laptop hard drive is running out of space that you have to upgrade your small hard drive to a larger one. Or you may find that the SSD (solid state drive) has a faster running and reading speed, and you want to use SSD to replace Gateway laptop hard drive for a better performance. But no matter you want to upgrade Gateway laptop hard drive to a larger one, or change it with an SSD, you need to figure out how to upgrade Gateway laptop without losing data. To upgrade Gateway laptop hard drive doesn’t mean that you need to reinstall the operating system and losing old data on the old hard drive. You can upgrade Gateway laptop hard dive without losing data as only as you use AOMEI Backupper Professional. 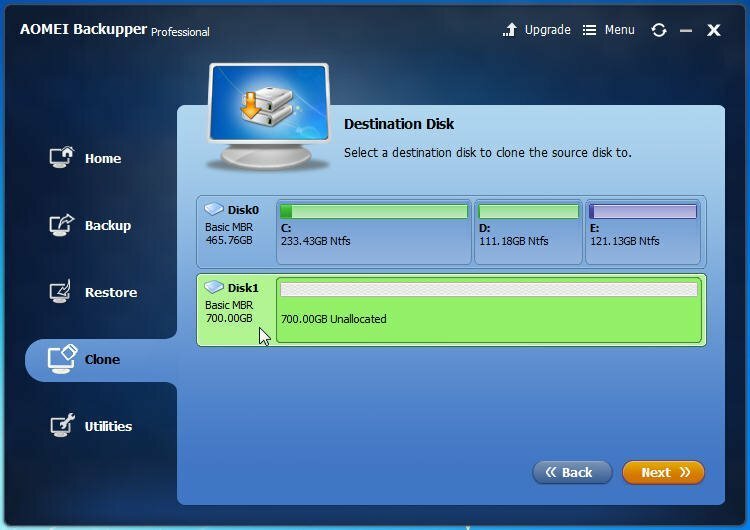 AOMEI Backupper Professional is a great software that you can use to upgrade HDD to SSD, or to a larger hard drive without losing data. It can work with Windows 10/8/7/Vista/XP. Here you can follow the steps below to setup the task of Gateway laptop hard drive upgrade. If you need to upgrade the Gateway laptop hard drive to a larger hard drive, you need to prepare another larger hard drive in previously and connect it to your laptop successfully. If you want to replace the Gateway laptop hard drive with an SSD, you need to prepare an SSD that at least can store the all data on your old hard drive (It allows you to upgrade HDD to smaller SSD), and connect it to your laptop. Install AOMEI Backupper Professional on your Gateway laptop. Step1. Launch AOMEI Backupper. 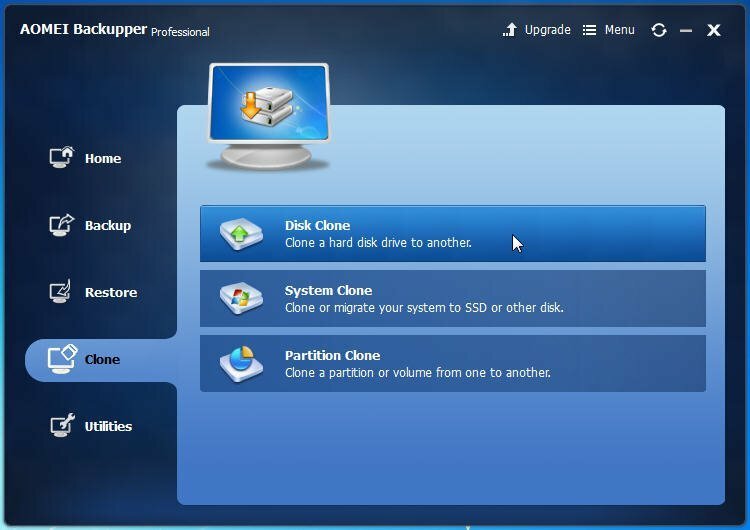 To upgrade Gateway laptop hard drive without losing data, you should click Clone -> Disk Clone. Step2.Then, select your old Gateway laptop hard drive as the source disk. Click Next. Step3. Select the larger hard drive or the SSD you prepared before as the destination disk. Click Next. Step4. Here you need to confirm all operations. If there is no problem, you can click Start Clone to execute the task. You can edit partitions on the destination disk by opening the setting icon so that the partitions on the destination disk would be at the best status after cloning. The “Sector by sector clone” is not recommended because it will clone every byte on your hard drive, which asks more time and more space. If you are upgrade HDD to SSD, tick the checkbox of “Align partitions to optimize for SSD”, which can improve the performance of your SSD after cloning. AOMEI Backupper is such a great backup and restore software that you can use to upgrade hard drive without reinstalling Windows and without losing any data. It can also help you backup system and restore computer to earlier date, and many other things for keep your data safe.